Forget a pot of gold. You'll find a treasure of a snack at the end of this rainbow. 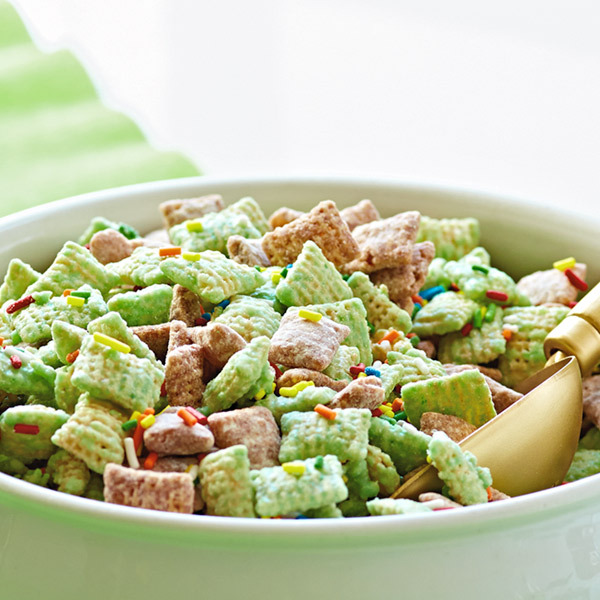 Our colorful and crunchy St. Patrick's Day snack mix recipe combines rice cereal, chocolate chips, peanut butter, powdered sugar and rainbow sprinkles to make a big bowl o' good green fun. This quick and easy party mix is sure to become a tasty St. Patrick's Day tradition with your little leprechauns (pssst...grown-ups love it, too!). Divide rice cereal equally into 2 bowls. Melt the milk chocolate chips, peanut butter and ¼ cup of the butter in the microwave at 50% power for 1 to 2 minutes, stirring at 30-second intervals until mixture is completely melted and combined. Add ½ teaspoon vanilla to mixture and stir well. Pour the mixture over 1 bowl of the rice cereal. Stir carefully to coat all the cereal. Add powdered sugar to a 1-gallon zip-top plastic bag. Add the coated cereal to the bag and zip the bag closed. Shake the bag until the cereal is completely covered with powdered sugar. Pour out coated mixture onto a cookie sheet and spread out to dry completely. In another bowl, melt the white chocolate chips and remaining ¼ cup of the butter at 50% power, for 1 to 2 minutes, stirring at 30 second intervals until mixture is melted and combined. Add the remaining ½ teaspoon vanilla and a few drops of green food coloring. Stir until the white chocolate mixture is light green. Pour the white chocolate mixture over the remaining rice cereal and stir carefully to coat. Spread the cereal on another cookie sheet and shake rainbow sprinkles over the mixture. After both mixtures have dried, combine them in a large bowl.